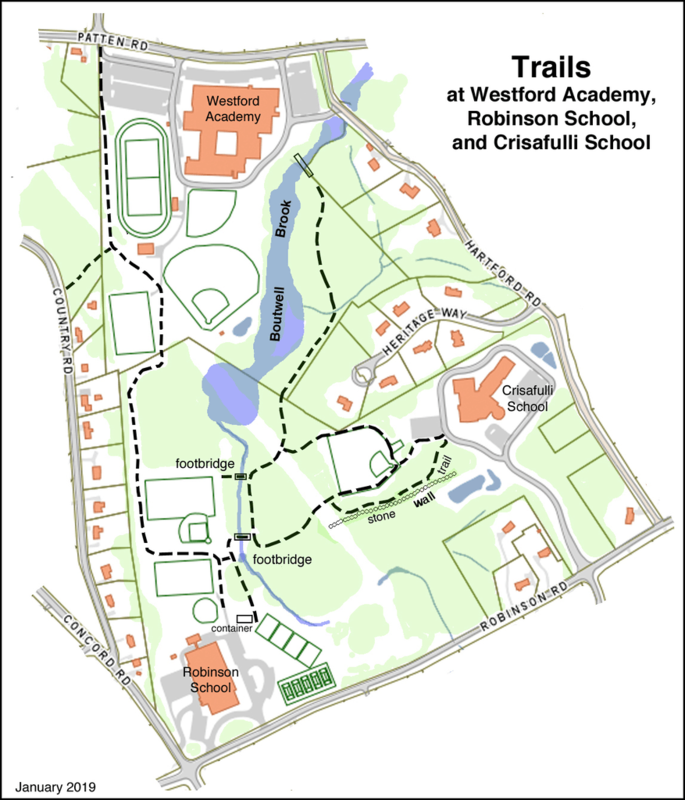 Westford Academy, Robinson and Crisafulli schools have been connected by trails since the school buildings existed. They are a convenience for neighborhood children to get to and from school, and they provide shortcuts between the buildings. Sports teams also use them for safe running away from street traffic. In 2016, the trails were mapped, and new signs were posted at the popular trailheads at Crisafulli, Robinson, and Country Road. The trail between the athletic fields of WA and Robinson is suitable for heavy equipment to service the fields. But the others are scaled for pedestrian traffic, often within the forest, sometimes skirting ball fields or crossing a power line right of way. Can you find the classroom in the woods, a few steps from a trail? I’m sure both students and teacher enjoy a lesson outdoors on a fine day. There are three bridges over the headwaters of Boutwell Brook, all different. The one nearest Robinson School is short and has a handrail. The brook is narrow but runs quickly here. The next bridge downstream consists of two sections of telephone pole, so it is a bit of a challenge for adults, but not for most grade schoolers. The bridge near the Academy is one of the longest trail bridges in town. It is not straight, and time has made it not quite level side to side. It provides a safe but interesting brook crossing.